Super Bowl 2018 - known to football fans as Super Bowl LII - kicks off on February 4, 2018 at 3:30 pm PST / 6:30 pm EST. The match-up will be between the New England Patriots and Philadelphia Eagles should make for a fair football game ... even if we’d rather have seen two of our favorite underdog teams - the Minnesota Vikings and Jacksonville Jaguars - there in their stead. Of course, the game is just one aspect that people care about. More important to some folks are the accompanying commercials and party where friends come together and gather around their home entertainment centers, usually with a cold beer in one hand and a handful of chips in the other. Whichever pastime you prefer, throwing a killer Super Bowl party can be as challenging as completing a fourth and long - but, if you’re ready to up your party-throwing game, we’ve picked out a dozen or so tech gadgets that will help you take your party from 0 and 16 to Super Bowl champion status. Let’s start with the biggest ticket item first. The TV is the gateway to the big game and while it’s always fun picking a new screen for the whole family to enjoy, the shopping experience can be less enjoyable than running laps around the field. First up is the TCL 55P607 4K HDR Roku TV. Not only is this a great TV for the game thanks to its 4K HDR picture, but it’s great for the many movie nights, too, thanks to its addition of Dolby Vision, a format that enables better contrast and more vivid colors. It comes with Roku built-in which has apps like WatchESPN, FOX Sports Go and NBC Sports - perfect for the sports lover in your home. If you’re looking for something a bit larger, the VIZIO 65-inch M-Series XLED TV (M65-E0) is an awesome big-screen TV that looks extraordinary. What makes this TV a real winner is VIZIO’s XLED panel control technology that offers enhanced contrast and colors. While XLED is no match for proper panel tech like OLED or QLED, it’s hard to get a much better looking picture at this price point. Of course, having a big screen TV is decidedly less awesome if no one can hear it. If your group of friends can get a bit … rowdy, you might want to invest in a new soundbar so that you can actually hear the game over the dull din of conversation. If you’re looking to elevate your audio game, the first step in the right direction is the Samsung HW-MS650 Sound+ Soundbar. It has awesome mid-range enhancing technology that boosts voices along with some pretty hearty bass response when it comes time to throw on an action flick after the game. It also doesn’t hurt that this awesome soundbar is around half the cost of similar-performing options from LG, Sony and Bose. If your definition of football is a little less … patriotic, you might like the British-made Q Acoustics M4 Soundbar. Much like the “proper” version of the sport of football, the M4 Soundbar is simple, refined and elegant. You won’t find a half-dozen HDMI ports here, nor will there be complicated setup instructions - but if you want a simple-to-set up soundbar without all the bells and whistles, the M4 is easily the best of the lot. The first two items on this list are the essentials; you simply need them in order to throw any run-of-the-mill Super Bowl party. If you want to throw an epic Super Bowl party, however, you’re going to need some other form of entertainment for when the game ends. Enter the Xbox One S, the PS4 Pro and the Nintendo Switch. For those folks who are not quite ready for the season to be over, there’s probably no better console than the Xbox One S with Madden 18. Throw this on the big screen after the game ends and some party goers might not even recognize that the game’s over. If you’ve got a slightly younger crowd to entertain, the PS4 Pro with FIFA 18 is sure to keep them occupied while the adults enjoy the game elsewhere in the house. With easy to pick-up controls and four-player multiplayer, FIFA 18 is a solid option for younger fans of footie. If you’ve got a mixed-age crowd on your hands, Nintendo Switch with 1-2 Switch is the party game to get. With dozens of mini games to pick from, 1-2 Switch is the perfect launching point and showcase game for your brand-new Nintendo console. Anyone who’s ever hosted an epic Super Bowl party knows that the party doesn’t stop at the living room - usually folks will stroll from the living room to the kitchen, dwelling in the latter during commercial breaks if their favorite team isn’t doing so hot. To accomodate all those folks who’d rather score the first serving of nacho dip rather than cheer a team after a first down, here are three spectacular kitchen gadgets that are guaranteed to keep both you and your guests entertained, informed and … uh, intoxicated. While announcer commentary is the primary form of aural entertainment in the living room, treat your guests to a spectacular music display with the Sonos One Smart Speaker. Capable of blasting tunes and answering inquiries simultaneously, the Sonos One Smart Speaker’s not afraid to work over time. If you fancy yourself a techie and chef, the Weber iGrill Smart Thermometer is a great little gadget to have in your culinary arsenal. Like its name suggests, the iGrill features built-in Bluetooth to keep you updated on the status of your home cooked meals. This is perfect if you’re making a few hamburgers for your Super Bowl crew, and even better when it comes time for the holidays and you find yourself in front of a robust, hard-to-cook bird. Of course, the last component of a perfect Super Bowl party - at least in my VERY STRONG opinion - is alcohol. The Fizzics Beer System scores you a perfect pour each and every time. While this might sound a frivolous, just think of the ramifications of a household of semi-drunk party goers: over-carbonated drinks spraying on your living room carpet and a trash bag’s worth of empty bottles to pick up after the party’s over. Avoid the mess by letting this beer system play bartender for the night. If you’re lucky enough to live in a place that wasn’t hit by last month’s Bomb Cyclone, you might have the luxury of taking your tailgate party to the backyard should rain not interfere with next Sunday’s game. With green grass underfoot and a cool breeze running through your hair, keep your guests long entertained with these awesome outdoor-party-enhancing tech gadgets. First thing you’re going to need if you’re going into the great outdoors for a party is a decent light. For party purposes, there’s none better than the Philips Hue Go. With the ability to program the light show using your phone and integration with smart home speakers for when it’s time to head back inside, the Hue Go does a great job striking the balance between play time and work. If you’re looking for an ice chest that’s smarter than the same ol’ plastic chest your parents used 20 years ago, the Coolest Cooler builds a splash-proof Bluetooth speaker, a waterproof USB charger and a blender into a rugged, tailgate-ready cooler. Outdoor lighting? Check. Awesome cooler to store beverages? Check. It feels like we might be missing something … oh, right. A TV! If you actually plan on taking your tailgate party outdoors, you’re going to need a TV that can handle at least some of the elements. For that purpose, there’s no better substitute than a Sunbrite TV and an HD antenna. 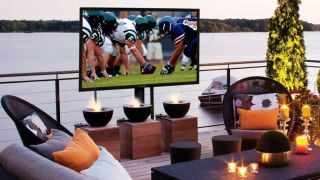 Born and bred for the outdoors, you can connect them to a power source, plug in an HD antenna and soon your backyard patio will be the best place to watch a game come BBQ season.